Cleaning the Deodoriser in a Samsung Fridge. Some fridges from Samsung come with a deodoriser that will need to be cleaned periodically. For best results, the deodoriser cartridge should be cleaned about once or twice a year. Please follow the instructions below to clean and locate the deodoriser in your Samsung Fridge. Note: Not all Samsung fridges come with a deodoriser. You can check your particular model by downloading the manual from Manuals & Downloads. To clean the twin deodoriser, remove the cover with a flat head screwdriver. 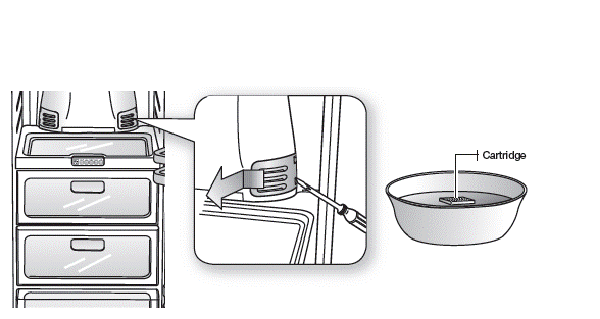 Remove the deodoriser cartridge form the cover and soak it in clean, warm water for at least 4 hours. Then, allow the cartridge to dry completely before replacing it in the holder. This can take up to 8 hours in a well-ventilated area. While holding the top and bottom sides of the filter case, unlock the filter case to reveal the deodoriser filter (A). Remove the deodorizer cartridge form the cover and soak it in clean, warm water for atleast 4 hours. If you require more information for your appliance, please consult the user manual from our Manuals & Downloads page. Otherwise, please get in touch with our Samsung Care experts on 1300 362 603 (Toll Free in Australia) or contact our Live Chat Australia team.